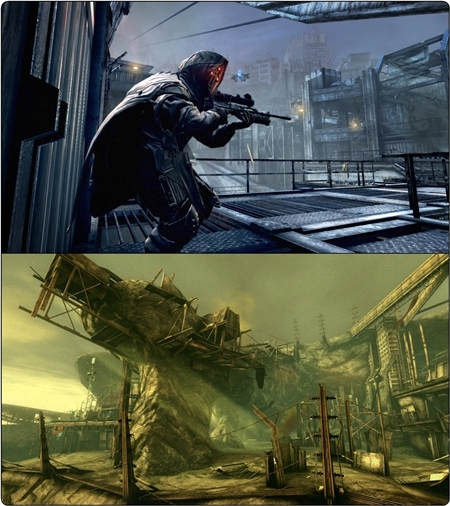 This is the third map pack released for Killzone 2. 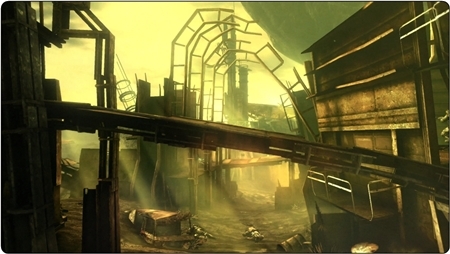 It features two new multiplayer maps and two new weapons. All of which you should be familiar with to some extent as they appear in the single player campaign. The first map is Suljeva Cliffside, which is from one of K2’s dustier browner levels. This is from a very brief section of the single player game that you will have passed though in a matter of minutes. It is a fairly straight map with a couple of underground tunnels with sentry guns guarding the passages. Outside there are twisted remains of metal huts which make for handy hiding spaces. The level itself is on a hill with one team at the top and the other at the bottom, it’s almost like a valley with a high verge on one side and buildings on the other meaning you’ll be wide open in this gauntlet like section. At the bottom of the hill there are large panels of metal stuck in the ground which act as cover for any assault coming down the hill. The tower at the bottom is something you are required to blow up on some missions. This map supports the flamethrower weapon, but there’s a catch. You cannot spawn with the weapon by choosing it from your loadout selection. Instead one, I repeat one, randomly appears on the map. You can only get it for yourself by picking it up first or killing whoever has it and nabbing it off their corpse. This might be because it is very powerful, thus keeping games balanced, as it does massive damage and takes ages to put yourself out if you get flamed. You can’t help but feel cheated though after being promised new weapons only to realise you’ll rarely get a go. Giving each player the weapon at random points when they re-spawn would have been a fairer option. Both maps support all mission types but Suljeva has a tendency for all the action to bottleneck in the middle. Luckily the second map offers a much more varied experience. The Arctower Landing, which brings us back to good old grey Killzone. This map is significantly stronger than Suljeva though as the action is more spread out rather than pushing everyone to clash in the middle. Although not exactly symmetrical the general layout is quite similar on both sides meaning nobody has an unfair advantage. There are little battles that break out all over this varied map. A duck and cover battle for possession of a bridge with both sides able to side behind cover on each side, a squared area walkway with an upper floor on both sides, storage areas and a couple of narrow, dark allies for shotgun lurkers. This unique weapon for this map is the boltgun. Very deadly and maliciously amusing pinning the opposition to walls with it, but ultimately it suffers from the same stingy availability issue as the flamethrower mentioned above. Except it seems to be even rarer. The more open layout of the map is much more suitable to all the game modes and feels a lot less cramped than the Suljeva Cliffside with a full 32 player match. Naturally you can opt to practice against AI bots offline in all game modes to learn the map inside out. Or you can go for the usual trial by fire that goes with the territory of walking out onto a new map. More Trophies have been added for these maps too, involved getting 10 or 20 kills with the special weapons in one round, or racking up 50 kills with any weapons in a round. Ambitious then? Overall even with the stingy use of new weapons and slightly cheeky level recycling this is a worthy addition to Killzone 2’s online matches that veterans will lap up for £4.79. Or if you fancy a bit of a discount you can now get all three map packs for £9.99. We’ll have a review of that bundle here very soon.